The FDNY was called to the Williamsburg Bridge for a man sitting on the subway tracks, officials said. 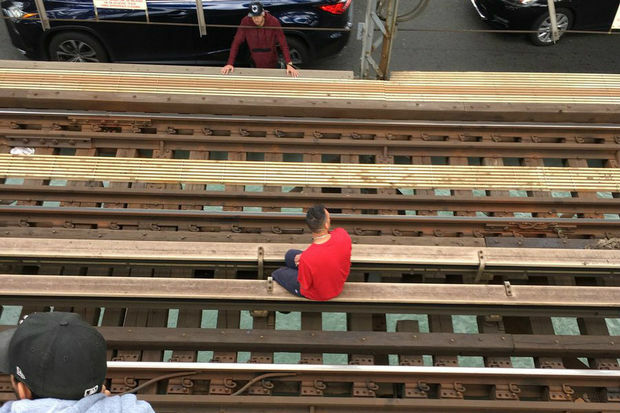 WILLIAMSBURG — A man sitting on the subway tracks on the Williamsburg Bridge briefly halted J and M train service over the East River Thursday morning, officials said. Service was snarled between Essex Street on the Lower East Side and Hewes Street in Williamsburg after the man sat on the tracks around 9:45 a.m., the MTA and FDNY said. Service resumed with some delays about 30 minutes later, the MTA said. The man, who officials described as emotionally disturbed, was taken to Woodhull Hospital for evaluation, the FDNY said. NYPD officials didn't immediately have further information.